Wow! What a labor of love there - it is so wonderful! That block of signatures is fabulous - I love all the little drawings and handwritting. Thanks for sharing the story with us. Amazing! I've never seen anything like this quilt. It is beautiful! You told a great story and I love the signature back too! Sometimes being a little insane produces wonderful results. It's beautiful! This quilt blows my mind every time I see it! Looks like all your hard work was worth it! Hope your sanity's still intact though... hehehe! oh my gosh, all that hard work. I can why it drove you insane several times. But just look at how beautiful it is! And I adore how you treated the siggy blocks in thier own section. It really tells the story! That is an amazing quilt. It turned out beautifully and I love what you went for with the back. The design is really amazing. The nine subsections are very obvious, but it is cool how the triangles in one block fit with the triangles in the next block and make complete squares within the whole design, but the colors separate out squares in another direction. I like the quilting you chose for it too. Nice job! That is a real treasure. I'm just a teensy bit jealous, but totally in a good way. BTW, this is my first stop on the Quilt Bloggers Festival tour :D. Thanks for making it such a good one! Astounding. I love it; but it was so much work. You're incredible. It's fantastic! I cannot imagine how many hours you have spent planning and cutting the pieces and then fitting everything back together. Oh I do love this quilt it represents so much! So glad you are sharing it in the Quilt Show! I think the idea of one done by value is interesting. I think about color value a lot more now because of Sabrina. She can tell the difference between yellow and red because of value. But she calls most browns, purples and pretty much any dark color "red." And conversely, a light green or blue she might think is yellow. Any in between color value, she has no idea. Vicki this is really great! I love the quarter-turn grid work! It really looks like a lot of work went into it. 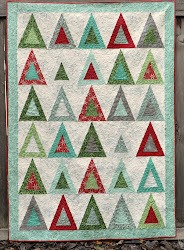 The angles and cross-seams are all perfectly aligned - what a quilter! I'm impressed with your blogging abilities as well! You're an inspiration. I just wish half of what I've planned out in my head were finished. This is beautiful! I'm not sure I have the patience for such an involved design so I'm in awe!! Love it! Wow that's an amazing quilt, definitely need patience for that one :) Nicely done! Your quilt is fabulous! You did a wonderful job! Wow, beautiful! All the fabrics are lovely, and they make such a stunning statement all together. I am so impressed with this beauty. I will join you in an Aunt Jane quilt... It's been on my to-do for a while. When you get ready to get serious about it, let's talk :) Would be fun! Vicky, I am in awe...at your quilt and your perseverance! Well-done and congratulations! I LOVE this quilt! The overall design is so appealing, and the uniqueness of every fabric square is intriguing. I could lost looking at this beauty. Congrats on the finish- it's wonderful! Wow, what a great quilt. You did a terrific job with the shading and color values. Don't forget another label with info on its making. it's a stunning quilt. you must have tons of patience, and the result is worth every moment you spent on it. Wonderful quilt. You had to have spent so many hours on just getting the fabrics in the right place. Beatufiful job! This is a work of art! I bet you are glad it's finally done and now you can enjoy it. What a beautiful quilt. Thank you for sharing. OMG! It looks really tedious!!! I don't think this is something I would try but I certainly appreciate it's beauty. wOw! What an amazing achievement! This quilt is beautiful and I love how you finished the back with the siggy blocks! That is such a super quilt. I love how you collected all the fabric. 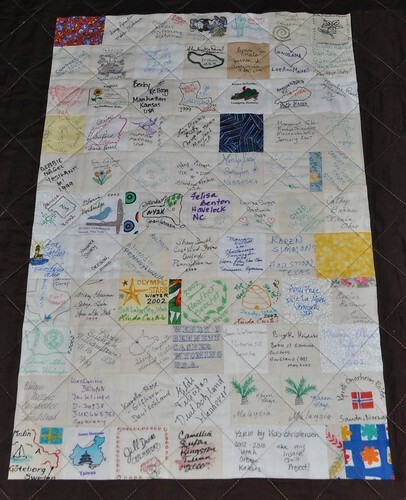 And the signatures on the back, wow that is really a special quilt. So very pretty I love it. What an amazing quilt. The notion of selecting the fabrics and arranging the blocks and partial blocks is truly intimidating, let alone the sewing. Wow! Great quilt! A true labour of love. 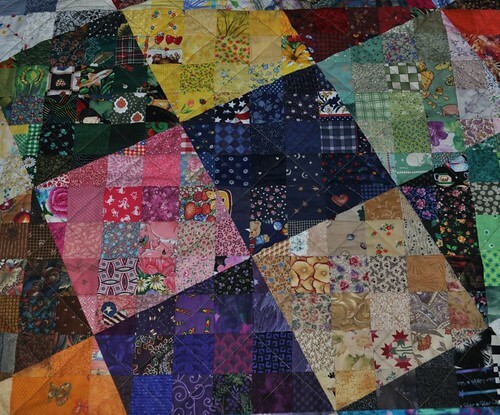 An amazing, beautiful quilt. Some of those fabrics you wouldn't think would work in a watercolor quilt, but they do!!! Congratulations. This is wonderful. A quilt to be very very proud of. THanks for sharing. Absolutely beautiful! Do you have a pattern you could share? I would love to make it but am not clever enough to figure out how! That is an amazing quilt! I have seen the magazine - I recognize the pattern. You did a wonderful job. Gorgeous. Love the back with the signatures. How can anyone not fall in love with this? That signature block is fantastic! this is fabulous; I want to be adopted so I can inherit this quilt! Great job. What a beautiful quilt!! Was this quilt in a quilt show this summer in springville utah? 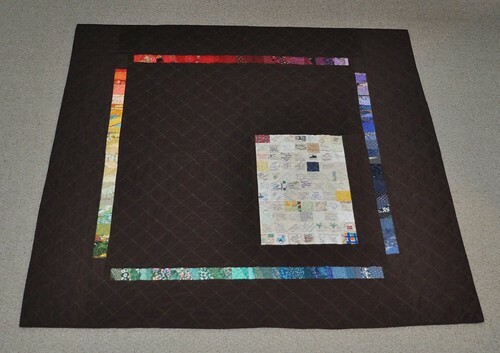 This is stunning Vicki, I can't even begin to imagine the hours you have spent on this quilt. 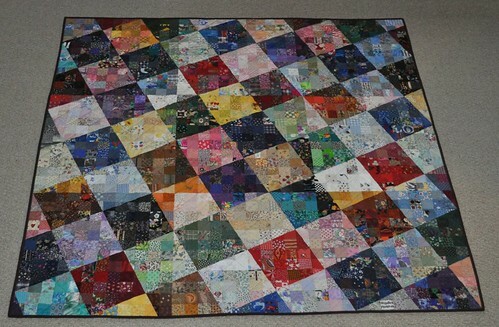 I love value quilts and this is absolutely gorgeous, and I love the signature block on the back and the rainbow strips.